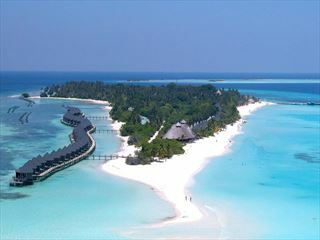 Elegant, modern and relaxed, Velassaru Maldives ticks all the boxes for an unforgettable luxury holiday. 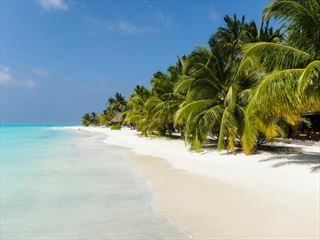 Boasting exotic scenery, chic facilities and the gorgeous soft sand that the Maldives is famous for, the resort stands out as a truly lovely place. 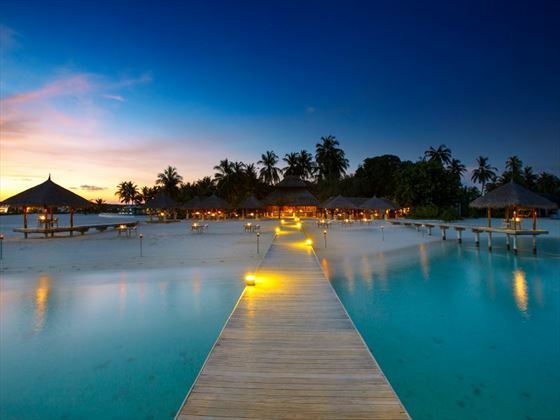 The relaxed atmosphere makes it ideal for couples with a range of fantastic restaurants and wonderful overwater villas – a very romantic choice. Whether you opt for a Deluxe Bungalow or a Water Suite, you'll be treated to gorgeous minimalist decor and style, with ocean blues and teak furnishings adding to the island feel. We'll always recommend booking one of the bungalows with a private pool, offering a secluded spot to swim and sunbathe. The spa is unique and relaxing, offering wonderful overwater treatment pavilions so you can watch the soothing waves and tropical fish whilst indulging in a revitalising massage or body scrub. There's plenty of great water sports here too, from leisurely kayaking, to exciting catamaran sailing. We find days are best spent snorkelling, giving you the chance to spot amazing marine life amongst the crystal-clear waters. Once you've worked up an appetite, there's a handful of enticing restaurant that are sure to tantalise your taste buds. From the overwater Japanese venue Teppanyaki, to stunning oceanfront dining at Sand, there are many romantic dining moments to be had here. 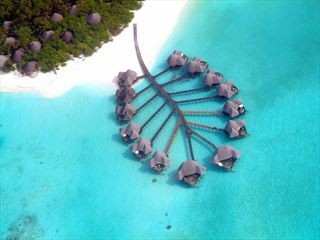 The resort is located on a private coral island in the stunning Indian Ocean. Complimentary beverages served with Lunch and Dinner. Beverages include water, soft drinks, juices, house-pouring beer, a selection of wines and liquors. You are required to produce a valid Wedding Certificate at time of booking and check-in. Offer applicable when travelling within 6 months of date of wedding.